Slithering Worm Found In McDonald’s Filet-O-Fish. Attention McDonald’s Filet-O-Fish lovers! There’s something new you have to worry about at McDonald’s…. WORMS! And we are not talking about the worms they grind up in their ground beef. McDonald’s is no longer purchasing fish from the Alaskan Pollack Fisheries. McDonald’s has always tried to maintain fish from areas only certified as sustainable by the Marine Stewardship Council, but that has become more difficult with each passing year. Year after year the price of pollock from these Alaskan fisheries continues to be on the rise. In order to increase their profits, McDonald’s has decided to import their pollack from China to produce their Filet-O-Fish sandwiches. Although it has about 50% more shrinkage when cooked as compared to the Alaskan pollock, it is still a much cheaper alternative than buying from the Alaskan pollack fisheries. As a result, McDonald’s is serving a lower quality product, farmed with harmful chemicals and diseased feed. Asian food production standards are basically nonexistent. Just because somebody has produced a “safety standard certificate” does not mean anything in China. Their fish are fed a diet of bird feces, and all these chemicals and diseases are passed on to you through your food. 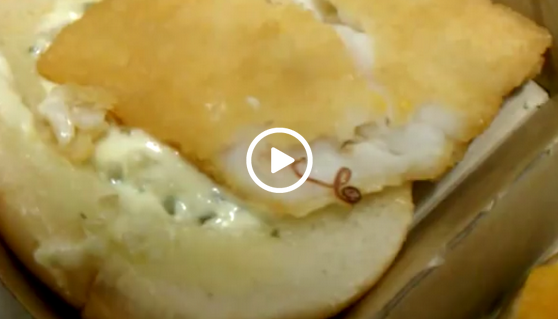 The worm in the video below is just a small example of what is lurking in your McDonald’s Filet-O-Fish. Inspect your food! But remember, just because you don’t see it, doesn’t mean it’s not there. You Won’t Believe What This 11 Year Old Found In Her Halloween Candy!